Published: Aug. 19, 2013 at 12:23 p.m. 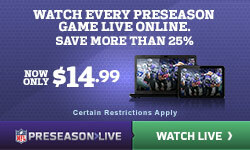 Updated: Aug. 28, 2013 at 01:50 p.m.
FOXBOROUGH, Mass. 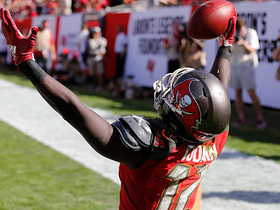 -- Perhaps a primer on the Tampa Bay Buccaneers' offense is in order. The team whose identity was for so long wrapped around its defense now possesses an upper-echelon offense, which ranked ninth in total yards, 10th in passing yards and 13th in points scored last season. The roster has been constructed using high draft picks and, in recent years, lots of free-agent cash, to present a balanced juggernaut -- with an emphasis on wide receivers, running backs and interior offensive linemen. 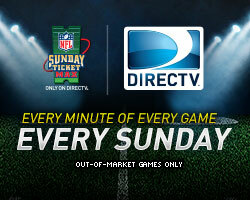 The April trade for cornerback Darrelle Revis, a franchise defensive player, was a signal that the Bucs believe they have the pieces in place to win now, to finally emerge from the long shadows cast by the New Orleans Saints and Atlanta Falcons in the NFC South and from the blackouts that have beset the team in the rebuilding process. So why doesn't quarterback Josh Freeman -- the linchpin of that offense -- have a long-term contract? He is playing out the final year of his rookie deal, and the absence of an extension has led to speculation that his hold on the QB job could be tenuous. That the offense has sputtered this preseason, as many of the starters have rested, has only fueled the sense that Freeman is in a prove-it year, particularly because he was inherited -- not chosen -- by second-year head coach Greg Schiano. Mark Dominik, the general manager who has overseen this reconstruction (including the drafting of Freeman), offers a comparison as a way to tamp down the idea that Freeman could be in trouble, even though the Bucs just drafted another quarterback in Mike Glennon. "I have a lot of respect for (Baltimore Ravens GM) Ozzie Newsome, and I think they handled Joe Flacco right," Dominik said, referring to the way that team allowed its quarterback to play out his contract before rewarding him with a blockbuster deal after his Super Bowl triumph. "There was never any animosity. There is none between this organization and Josh's agents or Josh. He knows we're all on the same page here trying to get the contract." There is, of course, substantial risk to such an approach. Freeman is not in Flacco's class -- for one, Flacco has gone to the playoffs in each of his five NFL seasons, while Freeman has never been -- but if the Tampa Bay offense performs the way it did for most of last season, Freeman's asking price will certainly rise, much as Flacco's did after he turned down a Ravens offer before the 2012 season began. Of course, that is a scenario the Bucs would gleefully welcome, because a better offensive performance over 16 games likely would lead to an improvement on the 7-9 record they finished with last year and a shot at the playoffs. More problematic is what happens if a two-game offensive slump late last season turns out to have been more of a precursor than an aberration. 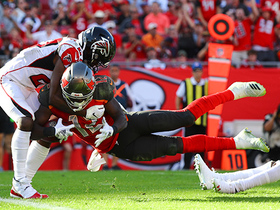 In those games -- December wipeouts against the Saints and St. Louis Rams, in which the Bucs scored a total of just 13 points -- Freeman threw one touchdown pass and eight interceptions, almost half of the 17 he gave up all last season. Just four quarterbacks have thrown more interceptions since Freeman entered the league in 2009. It is that snapshot that leads Dominik to state the obvious about what the Bucs want from Freeman this year: "Playing smart with the football, consistency and being able to take the shots down the field, making the plays with his arm he can make, is important. "We are all very hopeful -- Josh is only 25 years old," Dominik said about Freeman's status as his franchise quarterback. "That's the hope. That's the belief." That is well short of a guarantee. 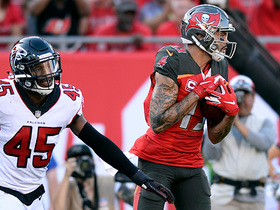 It is difficult to tell from the preseason results which version of the Bucs offense they will get -- and, by extension, which version Tampa Bay's decision-makers will be considering when weighing Freeman's contract. The unit has stalled in its two preseason games, during which many starters have played little, giving Freeman almost no chance to get into a rhythm. The starting offense has scored just three points, and on four drives, Freeman has been sacked four times. Freeman's protection has been awful -- granted, offensive guards Carl Nicks and Davin Joseph haven't played yet, and much of the New England Patriots' pressure on Friday night came straight up the middle -- and the results have been ugly: 75 yards on 22 plays, including 8 yards on eight plays against New England. Freeman and the other starters are likely to get much more work Saturday night against the Miami Dolphins. Still, Freeman seems startled by the question of whether or not he is on trial this year. "I wouldn't consider it any different," he said. "I think everything in this league is earned, it's something, no matter how it goes at the end, I'll be great. I obviously love being a Buccaneer, I love playing for Coach Schiano, I love my teammates. But I try to make the most of this year. You've got to seize every moment. I've got to soak it all in and be the best Josh I can be." When the Bucs selected Glennon, Schiano called Freeman to explain. The idea, Freeman said, is to stack the team with as many good players as possible. Dominik said Glennon was truly the best player on the Bucs' board in the third round. "Me and coach have a great relationship," Freeman said. "Everybody seems to think there is animosity." No, but everybody has seen unexpected quarterback scenarios play out before, even when the early indicators were good. After all, 2009 draft-mate Mark Sanchez went to the AFC Championship Game in each of his first two seasons -- an accomplishment Freeman isn't close to having on his résumé -- and now the New York Jets QB could very well lose his job to a rookie. Freeman is in no danger of losing his starting job soon. And Dominik is convincing when he invokes Flacco's lack of an extension prior to last season. But Flacco gambled on himself -- he turned down an offer figuring he could prove he deserved more. Freeman is in a much weaker position. 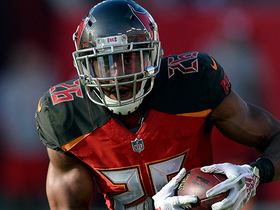 The Bucs have made clear they are in no hurry to extend him, with Schiano likely wanting to see him spend another year in the offense -- and have another year to develop as a leader -- before potentially deciding to cast his lot with the former first-round pick. "It's my fifth year with this team," Freeman said. "This is my team." The Bucs haven't said the same yet.